Two hundred miles east of Gibraltar in the Mediterranean Sea we saw two large floating black logs about 100 meters to starboard. It seemed odd there would be logs floating in the western Med, and so we made a ninety degree turn to starboard to inspect the floating debris. As we got closer, we noted that the logs had fins, and they were also moving through the water. How unusual. That's the first time we had ever seen logs with fins. Then the logs spouted water into the air. Logs that spout water are even more unusual. We started our second engine, and motored closer to see exactly what was happening. We glided cautiously through the sea at three to four knots as we made our approach. 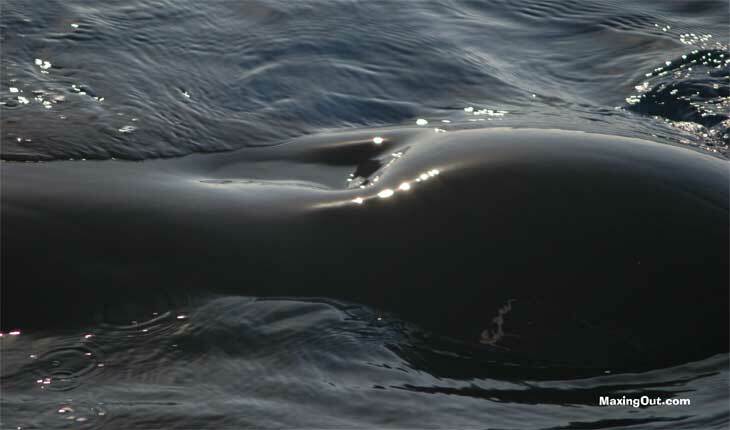 Suddenly the logs were transformed into pilot whales. A mother and her calf were cavorting in the smooth water. 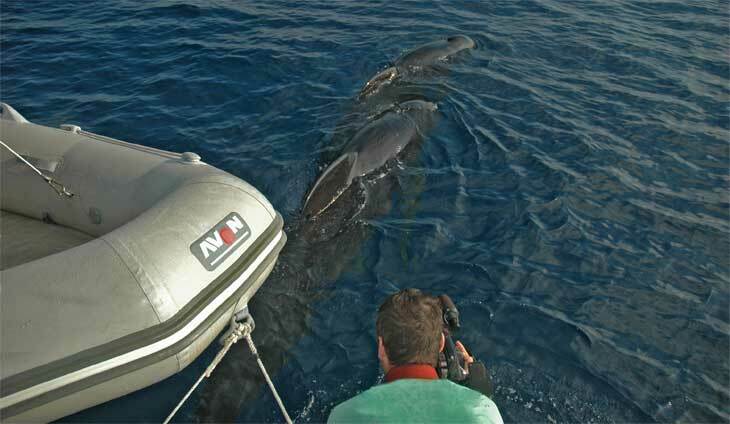 We slowed down, and Exit Only came within ten feet of these gentle giants who demonstrated no fear of our yacht. They dilly dallied about relaxing on the surface, sometimes remaining stationary, and at other times moving with the boat. Sometimes they dove under the bow and resurfaced behind the stern. 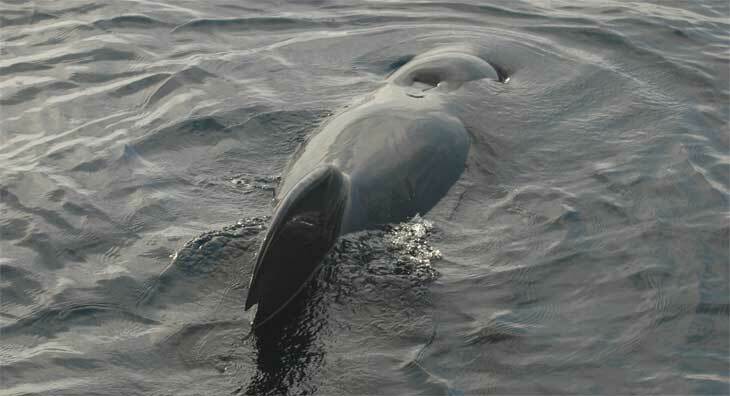 We slowly motored along with mother and child for half an hour until the male pilot whale showed up. He was all business. It was his job to let us know he would hold us personally responsible if any harm came to his family. We spotted him swimming directly for Exit Only when he was several hundred feet to the south. He wasn't meandering or cavorting. He was rocketing toward us, and he was on a mission. He surfaced beside Exit Only on the port side blowing bubbles under water in an obvious display to inform us of his presence. Then he came up directly under the catamaran , and began making a cacophony of squeals, grunts and bubbles echoing between our two hulls. He let us know he was there and that he was in charge, and if we stepped out of line, he would smash our fiberglass boat to smithereens with his immense bulk. We wondered whether he would become more aggressive and teach us a lesson we would never forget. At moments like that, you begin to think about boat insurance and life rafts. Any negative and fearful fantasies quickly disappeared from our minds as the gentle giant dove between our hulls and surfaced off to port at a safe distance. He had made his point without ramming our boat giving him a headache and us a headache as well. We got the message, he was satisfied, and he slowly swam away. Meanwhile, mother and child continued to cavort alongside our yacht. We followed them for another half an hour realizing we had been privileged to negotiate a truce on the high seas with these powerful creatures. They obviously meant us no harm. I sincerely hope these gentle creatures can stay away from those few remaining rogue nations that allow whaling to continue on the high seas. If there is an axis of evil anywhere in the world, it would include those human predators who commit whalocide, because they slaughter the innocent to fill their pockets with cash. Everyone should have the privilege of sailing with whales. Once they get to know these gentle giants, they will realize that driving whales into extinction is a crime against humanity.